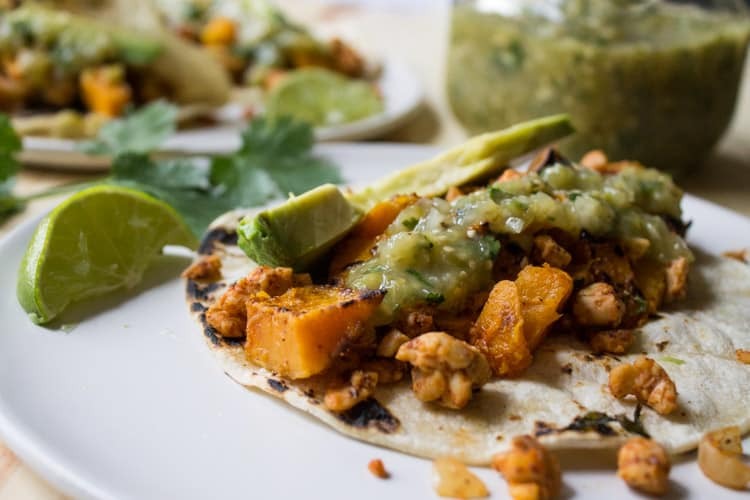 Vegan butternut squash and tempeh tacos topped with salsa verde make for a comforting and satisfying fall meal with a southwest twist! That time my Mom called and said she ate tempeh. Sure, Ma (can’t say no to your momma). 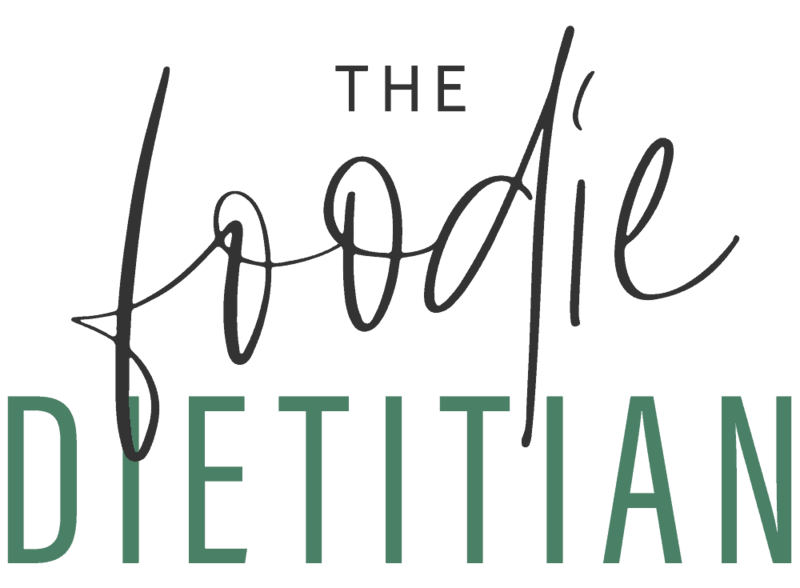 So we all have my dear mother to thank for the deliciousness that graces the blog today. These tacos are comfort food meets southwest. 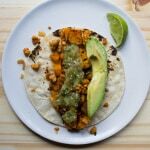 Tempeh and butternut squash pair perfectly together – the sweetness of the butternut squash nicely balances out the spices on the tempeh. What is tempeh, you ask? Well, back in the hay day (2010 to be exact), the second blog post I ever wrote was on tempeh – titled temp-huh? Clever, I was back then? Yes? 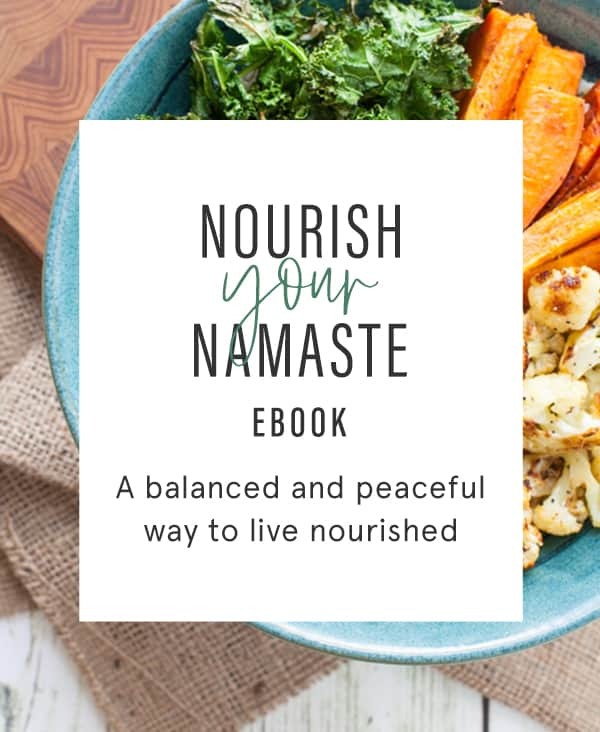 Tempeh is a fermented soybean product, which means not only is it a great source of vegetarian protein, but it also contains live and active cultures that are important for maintaining a healthy digestive tract and immune system. It’s pretty flavor-neutral (similar to tofu in this sense) so it will pick up the flavor of whatever you marinate it in. In this case, the tempeh took a trip to the southwest. Toss the butternut squash with 2 tbsp olive oil, cumin, cinnamon, salt and pepper. Place squash on a large skillet over medium-high heat and cook until tender and browned, about 10-15 minutes. In a large saucepan, add olive oil over medium heat. Once oil is hot, add chopped onion and cook for about 3 minutes. Add garlic, and let cook for another couple minutes, until fragrant and before browning. Add crumbled tempeh, taco seasoning, lime juice, and stir to combine. Let cook for another couple minutes, remove from heat and add cilantro. Place corn tortillas over an open flame (medium heat) on the stovetop. Let cook until tortilla begins to bubble and brown, less than a minute. Using tongs, flip over to cook the other side, until it begins to brown and bubble. 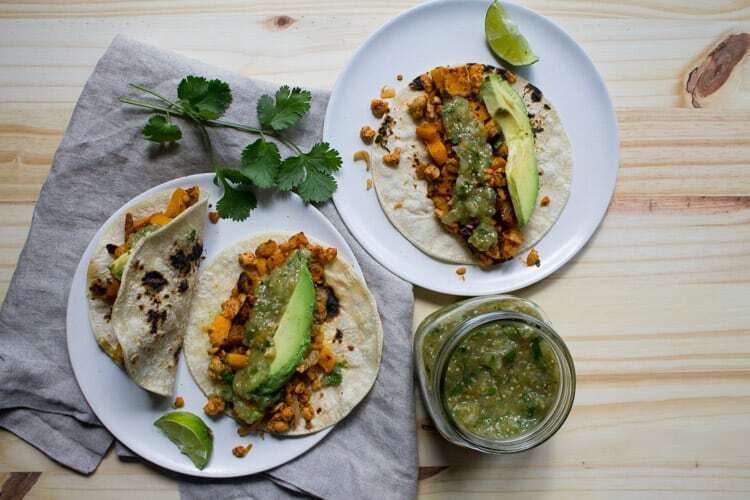 Assemble tacos by adding the tempeh mixture, butternut squash, and salsa verde. Top with a squeeze of lime and avocado slices. Optional for vegetarians: add queso fresco and/or plain Greek yogurt as a topping. Roast tomatillos, onion wedge, garlic, and jalapeno on a lightly greased skillet over medium-high heat. Using tongs, continue to rotate vegetables so that they’re blistered on every side. Roast until tender and blistered, about 10 minutes (note: tomatillos will take longer). Transfer onion, pepper, garlic, and tomatillos to a food processor. Add lime juice and water. Pulse to combine until smooth. Add salt to taste. Transfer to a serving bowl and stir in chopped onion and cilantro. Tomatillos will take longer to roast (wait until they start to release their juices to remove from heat). Tell me, have you ever tried tempeh? What’s your favorite way to prepare it? I’ve NEVER tried tempeh before. I have to make this! 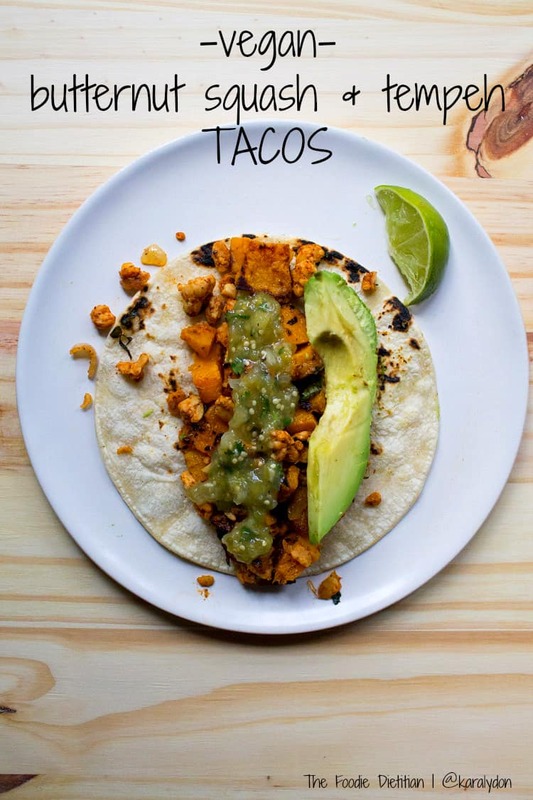 Tempeh tacos are my favorite way to eat tempeh. Enjoy! 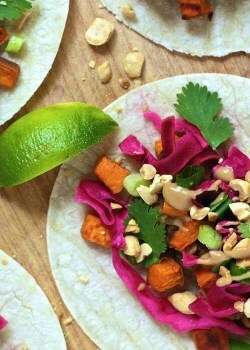 I made these last night for dinner and they will absolutely become a taco staple in my house! They were so delicious. I used a previous commenter’s tip and steamed the tofu for 10-15 minutes – it was perfect. (I steamed while the squash was roasting. The salsa verde was RIDICULOUSLY good. Cannot wait to have leftovers and make again!! Awesome! So glad you enjoyed them, Kaity! I too have been steaming my tempeh ever since Rachel recommended it. Such a great tip. These tacos look great! I look forward to making them! They were delish! Let me know how they turn out for you. Enjoy, Denise! Great recipe, Kara! I love tempeh! Not a big fan of tofu, but tempeh is a whole different story. A cooking tip I just learned in culinary school last week. Steam the tempeh for about 10-15 minutes. It soaks up the marinade so much better when steamed! It’s so easy to cook with, Janice! And I love that tip from Rachel above. Definitely steaming next time. These look incredible! Love the addition of cinnamon. That story about your mom is too funny, I could never imagine my mom telling me she had tempeh, lol! I’ve never tried it myself, but I really want to make a recipe with it! 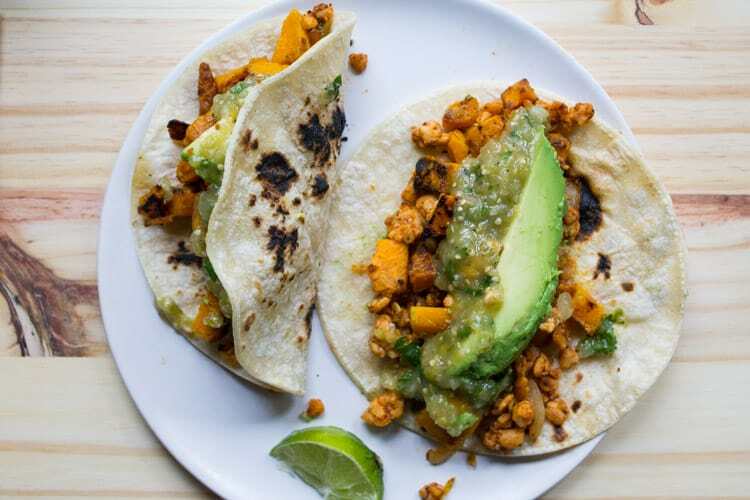 These look so yummy – I’ve been on a taco/tostada tear (ever since I started making my own tortillas thanks to Lindsay @ Lean Green Bean) and my post today talks about how I want to start eating more soy/tofu. I think your recipe will be my first attempt at tempeh! Woohoo! 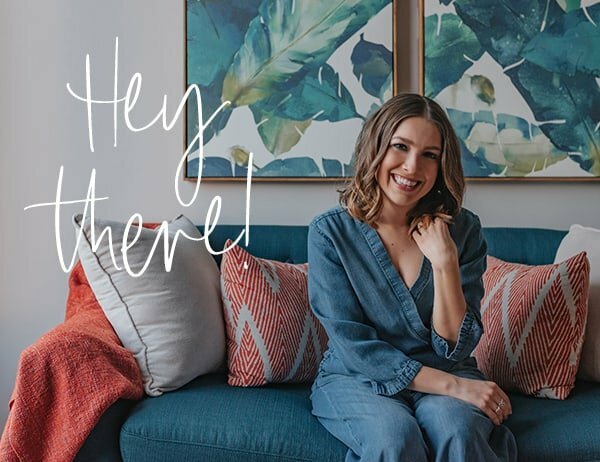 Can’t wait to hear about your first tempeh attempt! And I gotta try making my own tortillas – looking for that recipe now! These are awesome!! Love new and creative ways to do tacos. I’ve put tempeh in sandwiches before but haven’t experimented too much. This sounds delicious! :] I discovered the existence of tempeh from a food truck in NJ a couple years back, but sadly, have not had it since then. I’ve never tried making anything with it yet, so…pinning this for future experimentation! These sound DELICIOUS! 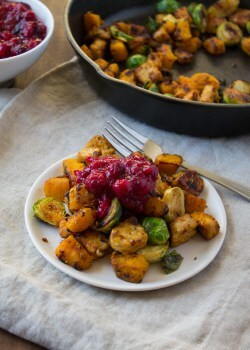 I love tempeh and what better to pair it with this season than butternut squash? I can’t wait to try this! Yes! Tempeh pairs beautifully with sweet B.nut squash! Let me know what you think when you try ’em!